Triella strongly believes in giving back to communities that support and empower us. Over our 15 years of operation we have donated to many charities in need. 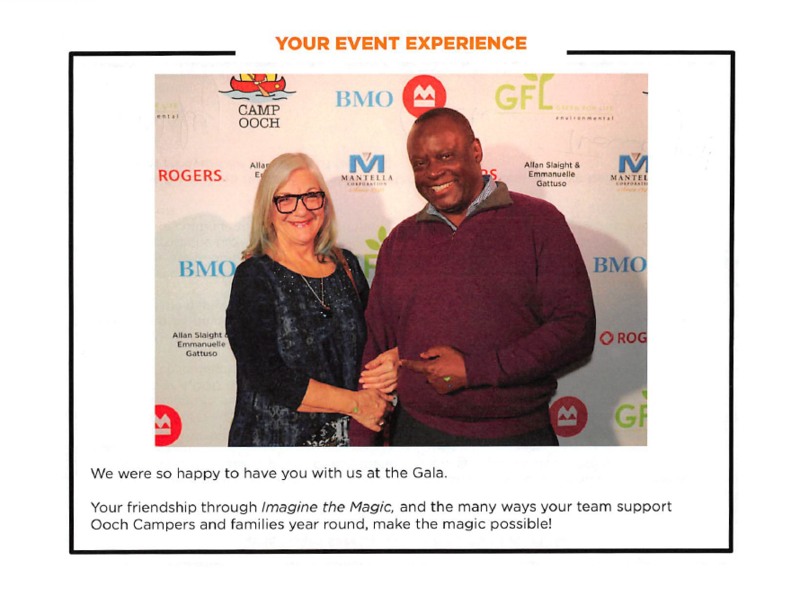 Triella was a Jays Sponsor for Camp Ooch at the ‘Imagine the Magic’ – Gala 2018 event. Camp Oochigeas (Ooch) is a privately funded, volunteer-based organization that provides kids affected by childhood cancer with unique opportunities for growth through challenging, fun, enriching and magical experiences. The charity operates year-round at various sites: Overnight Camp in Muskoka, at The Hospital for Sick Children (SickKids), various other pediatric hospitals and healthcare facilities in Ontario and Ooch Downtown. Camp Ooch continues to be the only overnight camp in Ontario to offer onsite chemotherapy IV treatment and blood transfusions. With over 450 annual volunteers, 41 full-time staff and a culture that was voted one of Canada’s top 10 most admired cultures by Waterstone in 2012, Camp Ooch continues to recruit loyal talent. Ooch does not receive any government or hospital hospital funding, meaning it solely relies on private funding. Help support Camp Ooch deliver happiness and treatment to sick children with cancer. Faraz Mehmood is a Sales & Marketing Coordinator at Triella. We are a technology consulting company specializing in providing technology audits, planning advice, project management and other CIO-related services to small and medium-sized firms. Faraz can be reached at 647.426.1004. For additional articles, go to our blog page. Triella is a VMware Professional Partner, Microsoft Certified Partner, Citrix Solution Advisor – Silver, Dell Preferred Partner, Authorized Worldox Reseller and a Webroot Reseller.